2015 CGOA Design Competition Winners! 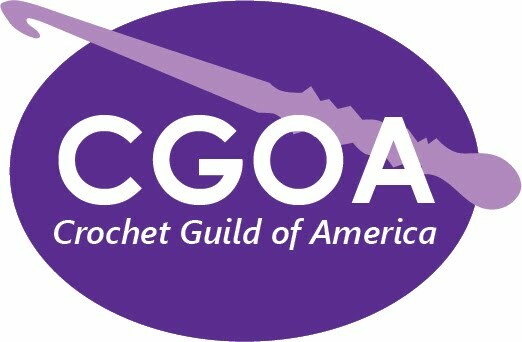 The 2015 CGOA Design Competition was held last week at the Knit & Crochet Show (the conference for CGOA and TKGA members) at the Town & Country Resort & Conference Center in San Diego, CA. There were many hands helping in the design competition this year. I want to personally thank my co-chair, Bobbie Matela, our judging manager, Karen McKenna, the many helping hands at the conference, including Edith Smith, Diane Miller and many, many more, as well as everyone who helped “man the booth” on the show floor (there are too many of you to list)! We couldn’t have done it without each and every one of you! Thank you from the bottom of my heart. Now for the announcement of the winners in the 2015 CGOA Design Competition! Please join me in thanking all of our generous and supportive sponsors this year. And a big “CONGRATULATIONS” to all the winners in each category of the competition! If you'd like to see photos of the winners, please see my blog post here: http://thecrochetarchitect.com/2015-cgoa-design-competition-results/. If you'd like to see photos of all the entries in this year's design competition, please see my Flickr album here: https://flic.kr/s/aHskfWHM9T. Now it’s time to get those hooks busy designing entries for next year’s CGOA Design Competition! Cute, cute, cute! That’s how I would describe this new booklet from Annie’s and author Donna Collinsworth. A unique offering, Playtime Stackers has six playsets that include stacking rings with a doll that hides neatly inside. For crocheters who like to make toys, this is a perfect fit. Projects are suited for both boys and girls. Instructions are written, without diagrams; but if there are any difficulties, just visit StitchGuide.com for help. All of the toys in this book would make adorable baby shower gifts or birthday presents for the little ones. 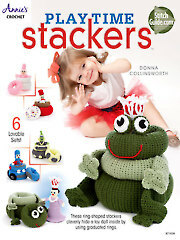 Full disclosure: A free review copy of Playtime Stackers was provided by Annie's Crafts. Although I accept free products for review, I do not accept additional compensation, nor do I guarantee a positive review. My reviews are based entirely on my honest opinions. If you’re a crocheter, you would have to be living under a rock to not know about crocodile stitch. It has been a very popular stitch for several years now. Enter Crocodile Stitch Afghans, a collection of five new blankets. My personal favorite is the Water Lily Throw. All instructions are written in a clear and concise way. As an added bonus, if you need any extra help to complete the projects, a visit to StitchGuide.com will clear things up. If you need a new crocodile stitch project, this book has it! Full disclosure: A free review copy of Crocodile Stitch Afghans was provided by Annie's Crafts. Although I accept free products for review, I do not accept additional compensation, nor do I guarantee a positive review. My reviews are based entirely on my honest opinions. Annie’s has done it again! Hooked on Crochet! 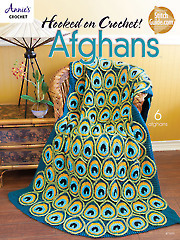 Afghans is a fabulous crochet pattern book and a great addition to my crochet library! There are six magnificent patterns by three great crochet artists. This 28 page pattern book has easy-to-read instructions, including written instructions and crochet graphs for each pattern. If you have been looking for a unique afghan pattern, this book is for you. The eye-catching Pretty Peacock Afghan (pg. 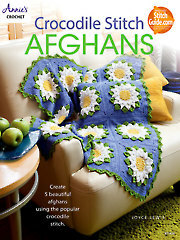 7) that graces the cover of this book is top on my list to make and has been one of my favorite afghans this year. Another favorite is the Bouquet of Daisies Afghan (pg.37); I would love to make this afghan for my own home, perfect for a summer throw. There is also a Jewel Tones Tunisian Afghan (pg. 4) and a Baby Heirloom Afghan (pg. 12) for those of you who are looking for something in those styles! The patterns in this book vary in skill level from easy to intermediate, but the clear and easy to read instructions would make any of these patterns doable for an average crochet hobbyist. If you love to crochet afghans like I do, I hope you will try one of the great patterns in this book and get Hooked on Crochet! Afghans into your crochet library too! Full disclosure: A free review copy of Hooked on Crochet! Afghans was provided by Annie's Crafts. Although I accept free products for review, I do not accept additional compensation, nor do I guarantee a positive review. My reviews are based entirely on my honest opinions. If you are interested in making lightweight summer accessories, do I have a book for you! Crochet with Love Knots by Jenny King has some beautiful and trendy designs in the famous love knot stitch. Plus, I have a confession to make. I never learned how to make a love knot. Trust me, I always wanted to, but I was intimidated by the complexity of how they looked. So, I decided to conquer my fear and learn a new stitch while reading this book to review. This booklet from Annie's features eight different and fashionable patterns using the love knot stitch. All patterns are rated easy to intermediate in skill level and use different weight yarns. The booklet includes detailed instructions with photos that excellently describe how to make a love knot stitch, plus there is also a stitch guide and metric conversion chart. When I find a little more free time, I am looking forward to making the Sunset Circlet Wrap. I think it would be a great addition to my wardrobe for summer. Something simple to dress up jeans and a tank top while still looking professional. Right now, I'm not sure what color I would want to make it. When you are ready to learn a new stitch and make some amazing accessory items, Crochet with Love Knots will make a great addition to your library. 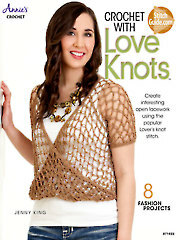 Full disclosure: A free review copy of Crochet with Love Knots was provided by Annie's Crafts. Although I accept free products for review, I do not accept additional compensation, nor do I guarantee a positive review. My reviews are based entirely on my honest opinions. Amamani Puzzle Balls by Dedri Uys features six adorable amigurumi animal puzzle balls. These loveable animals are based on traditional Amish puzzle balls. Each puzzle ball comes apart in three pieces. Many of the puzzle ball pieces are interchangeable. All of the creatures are super adorable and Dedri’s patterns are easy to understand and work up. The information section at the beginning of the book explains in great detail everything you’ll need to know to design you very own Amamani Puzzle Balls. The Basic Parts and Pieces section breaks it down even further. Additionally, each creature has detailed illustrations and photos to really help you follow along without question. This is one of the best designed books I have ever had the pleasure of reviewing. The Stitch Guide at the end of the book along with the website provided will help any experienced crocheter or very determined beginner, be able to make these adorable little guys (and gals). 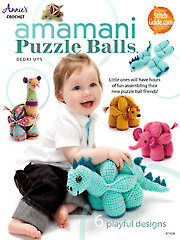 Amamani Puzzle Balls is available by Annies Crafts in either hardcopy or digital download for $10.99. Full disclosure: A free review copy of Amamani Puzzle Balls was provided by Annie's Crafts. Although I accept free products for review, I do not accept additional compensation, nor do I guarantee a positive review. My reviews are based entirely on my honest opinions.